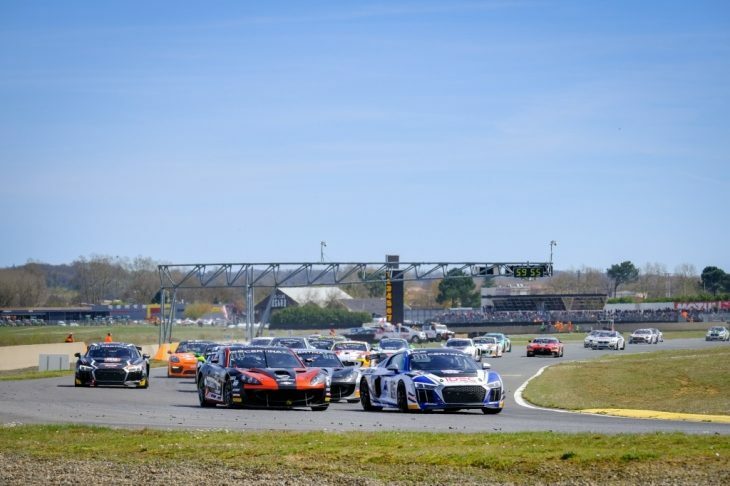 The first round of the FFSA GT4 Cup took place this weekend in Nogaro, France. A record grid of 39 cars attended the event. The line-up was diverse, with key additions being the new Audi R8 LMS and the Mercedes AMG GT4s racing in the French Cup for the first time. 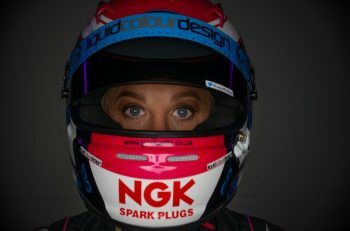 However, a few car models that fans were used to seeing last season (such as the McLaren 570S, the Ford Mustang and the Aston Martin Vantage) were absent. It was also the inaugural race for half of the 20 teams competing this weekend, including 3Y Technology, AGS Events, Baporo Motorsport, AKKA, Cool Racing, Espace Bienvenue, Foxo, Greensall Motorsport, M Racing YMR and Ormes Racing. Fabien Michal nabbed pole in the #42 Sainteloc Racing Audi R8 LMS (1:32.556), ahead of last year’s vice-champion Robert Consani in the #8 Speed Car Ginetta G55 (1:32.757) and Rodolphe Wallgren in the sister car #4 (1:33.058). Wallgren was fastest in the AM category. The three drivers took a clean start, with Consani trying to take the lead as soon as the race director flashed the green light. A few laps later, Consani overtook Michal easily in turn 9 and gradually took the lead. Meanwhile, Wallgren collided with Christophe Hamont in the #5 Sainteloc Racing Audi R8 LMS. Both cars ended up retiring. “I am really bothered by this,” said Hamont. “That’s two retired cars. I lost mine while I was breaking on the dusty side of the track. It’s my fault. The car is a little heavy: 1,700 kg with a full tank of fuel and the driver. We would have been fine if I had stepped on the break pedal five meters sooner.” The issue of the R8’s overweight (resulting from the balance of performance) and its impact on the tire wear was mentioned by several other Audi drivers this weekend. The #88 AKKA ASP Mercedes AMG went off track less than 15 minutes into the race. This triggered an eight-minute Safety Car. After the restart, Consani was able to keep his lead ahead of Fabien Michal and the first AM car, the #48 Orhes Racing Audi R8 LMS driven by Olivier Pernaut. Pits were opened for driver changes some 25 minutes into the race. Benjamin Lariche replaced Consani and easily gained a lead of four-five seconds. 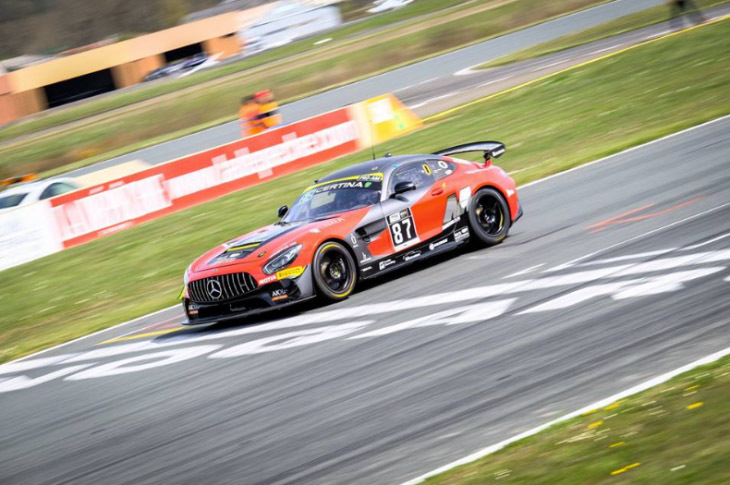 Jim Pla in the #87 AKKA APS Mercedes AMG ended up second after a very efficient pit stop, while the #64 VIC’ Team Porsche Cayman Clubsport MR driven by Eric Tremoulet was third. The top three positions remained unchanged until the chequered flag. The first BMW M4, the #17 L’Espace Bienvenue driven by André Grammatico and Ricardo Van Der Ende, finished in seventh position. The #25 AGS Event Porsche Cayman Clubsport MR won the AM category. It was a significant achievement for drivers Julien Lambert and Nicolas Gomar, as their Porsche started the race from the pits. Soheil Ayari proved to be the quickest with the #26 CMR Ginetta G55 (1:31.742), ahead of the #87 AKKA ASP Mercedes AMG driven by Jim Pla (1:32.224) and the #21 Sainteloc Racing Audi R8 LMS with Anthony Beltoise (1:32.268) at its wheel. Rodolphe Wallgren was again the fastest in the AM category (1:32:927). The top three drivers maintained their positions after the green light. Beltoise started losing ground from the fourth lap onward. “The front of my car was quite unstable so I decided to preserve the tires for my teammate,” he said after the race. The sister car, the #42 Audi R8 LMS driven by Gregory Guilvert, took over third position. Meanwhile, Pla attacked Ayari. On lap 7, Pla overtook the Ginetta at turn 8, but Ayari was able to regain his position at turn 9. One lap later, Ayari made a mistake upon breaking at turn 7, picked up some dust on his tires and lost first position to Pla. The lead cars pitted, and the top three positions remained unchanged until lap 30, when Sebastien Michal (replacing Guilvert) took second position from Tardif in the #26. Soon after, Tardif was closely followed by Robert Consani in the #8 Speed Car Ginetta G55 and Stephane Tribaudini in the #36 CMR Ginetta G55. The #26 predictably lost two positions. Consani kept insisting, taking second position from Michal with only four minutes left in the race. He even challenged the #87 for the lead on the final lap but never managed to overtake it. Stephane Tribaudini took the final podium position. 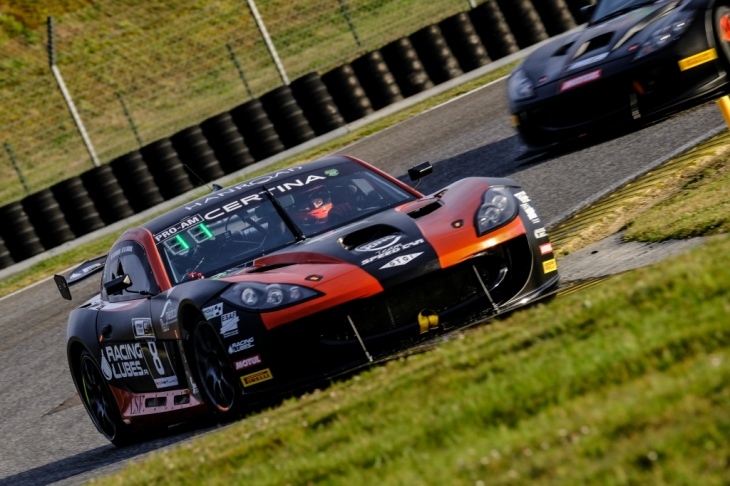 The #4 Speed Car Ginetta G55 driven by Rodolphe Wallgren won the AM category after leading the race from the very first lap onward. Next up for the contenders of the FFSA GT4 Cup is the second round of the season in Pau on 11-13 May 2018.